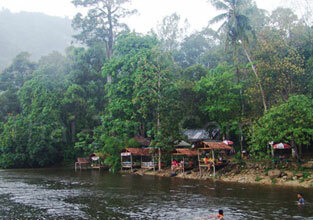 Nakhon Si Thammarat is one of the southern provinces of Thailand, at the western shore of the gulf of Thailand. Neighboring provinces are Songkhla,Phatthalung, Trang, Krabi, and Surat Thani. This province is the second largest city of the greatest history and background above any other town in the region due to its status as a first grade city controlling various subjected cities and towns, a place that houses Lord Buddha’s relics which is the most important statutory place of the south. Being the center of Buddhism during Sivichaya period. There are many tourist attractions which are very interesting that should know. 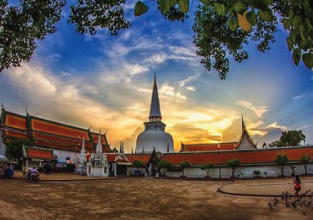 Wat Phra Mahathat Woramahawihan is located on Ratchadamnoen Road in Tambon Nai Muang. 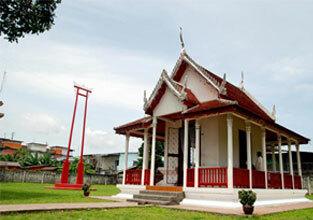 This is one of the most important historical sites in southern Thailand. The pagoda, 55.78 meters high, has a distinctive Sri Lankan style. The top is entirely covered by pure gold. Inside the temple are many buildings of importance, especially the royal building which has beautiful architecture from the Ayutthaya period and the Sam Chom building where the Buddha image attired in royal wardrobe Phra Si Thamma Sokarat is housed. There are also the Phra Maha Phinetkrom (the equestrian image) building, the Thap Kaset building, while the Khian and Pho Lanka buildings are used to display artifacts donated to the temple by Buddhists. Ho Phra Isuan is on Ratchadamnoen Road. It is a historical site of the Brahman religion. It has on display the Shiva Linga which is the symbol of Shiva, the Brahman god. There are also several bronze images such as the Siwa Nattarat image, Phra Uma and Phra Phikkhanet. The bronze images in this hall are replicas of the real images that are in Nakhon Si Thammarat National Museum. 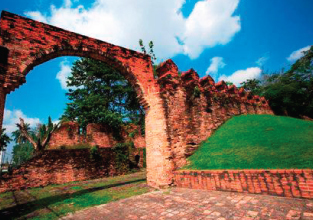 City wall is old wall of Nakhonsithammarat which located alongside Ratchadamnoen Road. The wall was renovated in the early Rattanakosin period and once more in 1990. The wall runs parallel with the city moat from Chai Nua Gate or Chai Sak Gate to the east for 100 metres. Ban Khiri Wong located at the foot of Khao Luang in Kamlon Sub-District which this village is an ancient community, near a path that goes up the mountain. The village is peaceful like one big and happy family. The main occupation is growing fruits, such as mangosteen, rambutan, durian, and Sato. The village was faced with catastrophe on November 21, 1988 when a flash flood swept away some 100 houses. The local monastery and villagers still maintain the damaged convocation hall and houses as monuments to those who perished. Ban Khiri Wong is considered a prototype of eco-tourism management and the place won the 1998 Thailand Tourism Award in the city and community category.